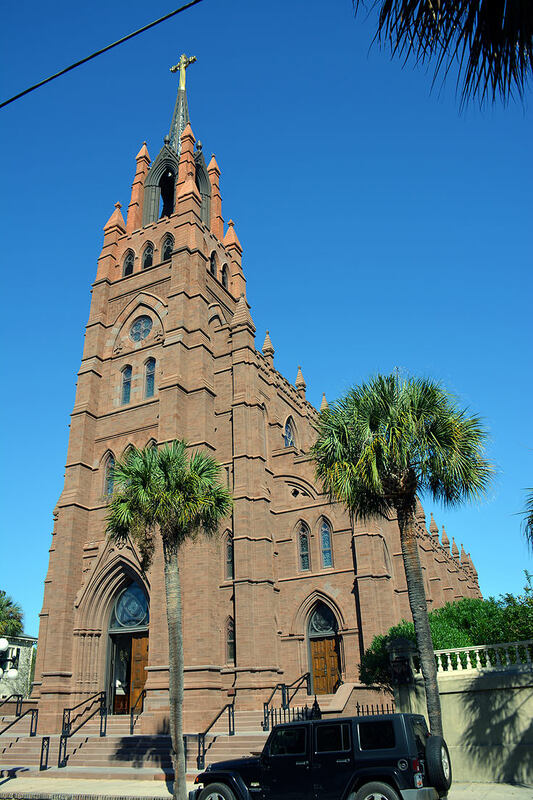 The towering Cathedral of St. John the Baptist is one of Charleston's premier religious structures, and arguably one of its busiest. With daily mass, multiple Sunday masses, and a heavy schedule of calendar of events, this gothic chapel is likely to be occupied during any quiet tour or visit. Distinguished as the mother church of the Roman Catholic Diocese of Charleston, the unique and impressive structure belies a stormy history that involves not one, but two such magnificent chapels, that is sure to fascinate visitors or all denominations. 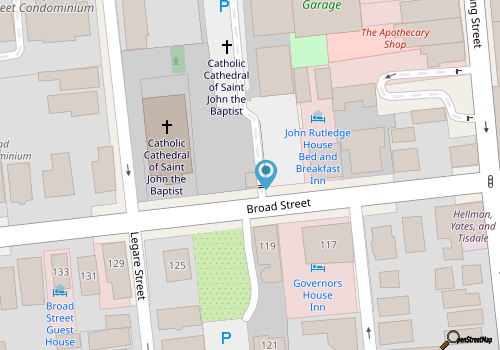 The parcel of Broad Street where the Cathedral stands was first purchased in 1821 by the church's original bishop, Rt. Rev. John England of Co. Cork, Ireland, who is buried in the crypt of the current structure. A new cathedral was planned for the central location, and the church leaders employed renowned architect Patrick Charles Keely, an Irish-born Brooklyn, NY resident who was responsible for the construction of an estimated 600 parish churches and cathedrals during his lifetime. Trained by the famous English architect, Augustus Pugin, Keely set to work plotting a brownstone cathedral that would tower over the downtown Charleston landscape. The church he created, which was completed in 1854, was called The Cathedral of St. John and St. Finbar, and was as impressive as Keely intended. The nearly 219' foot tall structure was topped with a spindly steeple and a bronze cross that measured 6' feet wide and 9' feet tall. The cathedral was certainly beautiful, and the congregation was undoubtedly pleased with Keely's impressive work. Unfortunately, this first cathedral, despite its size, would not last for long, and just 6 years after it was deemed complete, the Great Fire of Charleston in 1861 swept through downtown, leveling the church to the ground. The structure, the steeple, and the bronze cross were all lost in the flames, in addition to a seminary, the first catholic free school for girls, a 17,000-volume library, the office of the first Catholic Newspaper in the United States, (The Catholic Miscellany), and a number of sacred vessels and documents. The loss was devastating on its own, but combined with the financial hardships of the diocese that still dwindled after the Civil War, the congregation was without a home for much longer than anticipated. It wasn't until 29 years later that Keely was contacted again to return, in 1888, to completely rebuild the brownstone 14th century English Gothic Revival Cathedral. The process, again, was a lengthy one, and while the doors officially opened in 1907 to much joy and relief, the cathedral was never considered "finished." The steeple which was a hallmark of the original structure was never completed, due to lack of funds, and remains "missing" today, although passing visitors who never knew of the steeple's existence will most likely never notice the omission. The Cathedral of St. John the Baptist still towers over Broad Street, and visitors are sure to be wowed by the church, both inside and out. Inside, visitors will note the 14th century English Gothic style-inspiration with towering but arrow arched ceilings, ornate metal and bronze touches, and little details that make the structure reminiscent of the prominent English abbeys. There is no fee to access the church, although donations are greatly appreciated by visitors to help assist with an anticipated and much-needed renovation. The Cathedral of St. John the Baptist is open every day, from 10:00 a.m. until 3:00 p.m., with scheduled exceptions for special church services and maintenance. Masses are Monday through Friday at 7:00 a.m. and 12:05 p.m., while Saturday Vigils are at 5:15 p.m. Sunday services are held at 8:00 a.m., 11:15 a.m., and 5:15 p.m., and all Charleston residents and visitors are welcome to attend. The Cathedral of St. John the Baptist also features a number of special events, for youth and adults alike, which includes bible study groups, women and men's groups, and a B16 group for junior high and high school students. For more information on all programs offered by the church, as well as upcoming events and special services, visitors can access the cathedral's website at http://charlestoncathedral.com/.For special occasions and services, including weddings, church patrons can all the Cathedral of St. John the Baptist directly at 843.724.8395. The parish office is open Monday through Friday, 9:00 a.m. until 4:00 p.m. The Cathedral of St. John the Baptist may never be quite "finished," thanks to severe financial losses that were an indirect result of the Civil War, and a direct result of the Great Charleston Fire of 1861, but the structure nevertheless remains one of the most impressive cathedrals in coastal South Carolina. Considered a masterpiece of gothic design, and built, (both times, and in the same locale), by one of America's own masters, the impressive structure is sure to enthrall patrons from all walks of life. Truly a sizable and inspiring addition to the downtown historic Charleston scene, worshippers, and everyday visitors alike are invited to stop into the cathedral, which is open daily, and get a first-hand look into Charleston's magnificent and world-acclaimed architecture in all its distinctive forms. Washington Square Park, with its seasonally blooming azaleas, trickles of Spanish moss hanging off of ancient live oaks, and quiet setting in the heart of the city, is a romantic, serene destination that brings the inherent laid-back charm of Charleston, South Carolina to vivid life.